Its simply great if I'm on my headphones unless I have complete silence in the room I don't even hear it working, and when I'm playing forget hearing it at all, plus it also has great cooling capabilities. Definitely worth every penny spend on it. When I first hooked this up, I thought it was broken. It appeared to be running, but there was ZERO noise! I could hardly believe it! 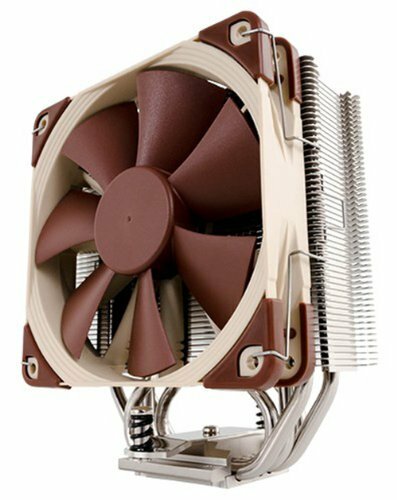 For that and the low temperatures it provides, Noctua has more than earned its sterling reputation. Simply brilliant. Very high quality piece of equipment - from the packaging to the materials to the 6 year warranty. Pretty much silent. Worth every penny. Keeping this 6600K cool is this monster. Very nice packaging. The long screwdriver bit saved the day since the case basically requires it. Amazing cooling and quality. Idle temp is 20 and full load is 44 on my 6700K. This doesn't sit over my ram so no clearance issues. I suggest this to anyone who wants a simple looking and performing air cooler. Incredibly silent, big enough to cool effectively and allow overclocking but small enough to fit in smaller cases and not interfere with you RAM or motherboard heatsink. The build quality is outstanding, both for the cooler and fans. You get used to the color scheme very quick, it looks a lot better IRL than in photos.